There's a Japanese supermarket I go to occasionally to purchase sukiyaki beef, shusi-grade tuna or salmon, miso, bottled sauces, etc. There are stalls with Japanese cooks promoting freshly-made specialties of the day that range from udon soups to stuffed croquettes to seafood fritters to sweet bean cakes. I can spend hours just moving from stall to stall, sampling every single tidbit, and come home with what the boys call "weird but good" things to eat, the latest being a savory pancake called okonomiyaki, which is a large frittata made with bits of octopus, julienned cabbage, noodles, and other unknown things in a creamy batter, pan-fried and drizzled with a barbeque sauce and mayonnaise. Very weird, but good. For dinner that evening, I had wanted to use up the leftover ingredients from the previous recipe, specially the fresh water chestnuts which were holding up well in the fridge. So I bought some very thinly sliced pork at the Japanese supermarket, and remembered a recipe I had earmarked in an old issue of Cook's Illustrated. After much tweaking, here's what I came up with. Frying the noodles into a crisp pancake can be a bit of a pain, but persevere, and you'll have a delicious dinner ready in no time. Feel free to substitute the pork with chicken or beef. 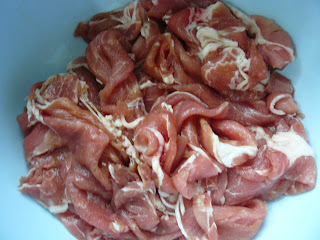 Marinate pork in 1 tablespoon each soy sauce and rice wine. Set aside. Bring water to boil over high heat. Add noodles and cook until just tender, about 2 minutes (do not overcook). Drain, then toss with white and light green parts of the spring onion. In the meantime, mix together hoisin, oyster and chili sauces, sesame oil, water, and the remaining soy sauce and rice wine in a bowl. Set aside. Heat 2 tablespoons of oil in a nonstick large skillet over medium-high heat for about 2 minutes. Spread noodles evenly across bottom of skillet; press with spatula to flatten and cook until crisp and golden brown, about 4 minutes. 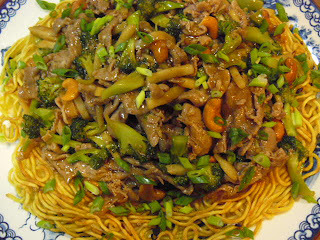 Slide noodle cake onto large plate. Add another 2 tablespoons of oil to skillet. 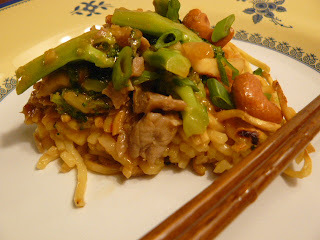 Invert noodle cake onto a second plate and slide it, browned-side up, back into hot skillet. Cook until golden brown on second side, about 4 minutes. Slide onto serving plate. Add another tablespoon of oil to skillet; heat over medium-high until just beginning to smoke. Stir fry ginger, garlic, and then the pork, separating the pieces while cooking. 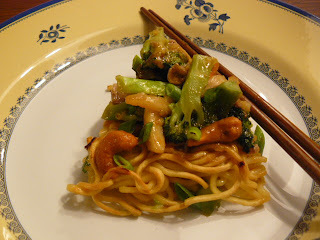 Add brocolli, water chestnuts and cashew nuts and stir fry for a minute. Add hoisin sauce mixture and continue to cook for another minute. Thicken sauce with a slurry of cornstarch and water. 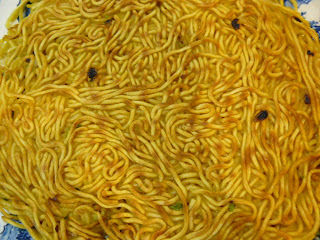 Spoon over noodle cake. 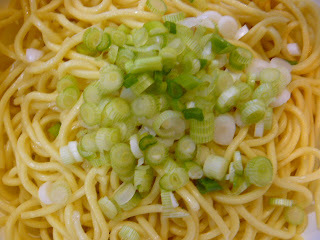 Sprinkle dark green slices of spring onion to garnish. Using a sharp knife or kitchen shears, slice noodle cake into wedges and serve. Naku, Annie, yet another dish that looks time consuming. Looks so good but I don't know if I have the patience to cook it. Leng, you could just serve it with the noodles simply tossed with spring onions and a little sesame oil, if you want a less fussy meal. The stir-fry itself isn't too time consuming, just the usual prep work. Try it! Thanks for your suggestion. I will definitely try it. My husband and I love noodles so it's worth the work. I'm inspired to prepare this tonight because I found some calamansi in the Oriental store. I'll let you know how it went.